French label NoMadMusic has released a pair of albums both recorded a few months apart in 2016 at Auditorium du Gennevilliers Conservatory, Paris. There are strong ties to the Paris Conservatoire in the case of several of the composers and also the performers on both albums. 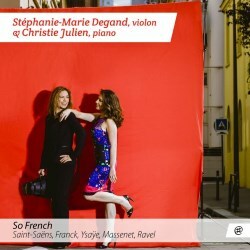 Titled So French the first release played by Stéphanie-Marie Degand (violin) and Christie Julien (piano) consists of five Franco/Belgian works for violin and piano with a composition span of around sixty years from Saint-Saëns, Franck, Ysaÿe, Massenet and Ravel. Alumnae of the Paris Conservatoire, Degand and Julien are now professors there. Opening the release is Saint-Saëns’ charismatic showpiece Introduction et Rondo Capriccioso written for Spanish virtuoso Pablo de Sarasate. Well controlled, the playing of the duo is assured and with a well-judged increase in intensity. In truth it’s hard to recommend this performance over several now ‘evergreen’ recordings such as Kyung Wha Chung sparkling performance with the Royal Philharmonic Orchestra under Charles Dutoit from 1977 on Decca. One of the most enduringly popular masterpieces in the chamber repertoire César Franck’s Violin Sonata was composed for another celebrated virtuoso Belgian violinist Eugène Ysaÿe. Very much at home in this work, Degand and Julien convincingly capture its refinement and poetry. The ‘Finale’ is suitably joyous and uplifting, communicating a sense that everything is all right with the world. In this much admired work Degand and Julien play well but I cannot look elsewhere than the blue ribbon 1977 recording from Kyung-Wha Chung and Radu Lupu that graces the catalogue of Decca for its poetry and refinement. A new work to me, Ysaÿe’s Caprice d’après l’étude en forme de Valse de Camille Saint-Saëns is reasonably appealing yet leaves little behind in memorability compared to, say, Saint-Saëns justly celebrated Introduction et Rondo Capriccioso. Another undyingly popular work Massenet’s Méditation taken from his three act Egyptian themed opera Thaïs is an entr'acte played between scenes of act two. Here Degand and Julien provide refined playing by creating an abundance of delectable allure. My particular favourite recording is that by Anne-Sophie Mutter and Lambert Orkis on The Silver Album released in 2014 on Deutsche Grammophon. The final work on the album is Ravel’s Tzigane, rapsodie de concert commissioned by celebrated British-Hungarian violinist Jelly d’Arányi. A virtuosic work with Hungarian Roma character sees the duo respond invigoratingly and with aplomb, providing colour and no shortage of style. Stéphanie-Marie Degand and Christie Julien support each other remarkably well, offering cultured and stimulating playing throughout. The duo is not helped, however, by the rather problematic acoustic which is bone-dry yet clear, with the piano and violin sounding clinical; robbed of tonal warmth. The piano is placed a touch forward in the balance and there is a slight echo heard markedly on the violin, detectable in the solo violin line to Ravel’s Tzigane. The accompanying booklet includes two short essays that concentrate on putting the four works in historical and cultural context but say virtually nothing about the works themselves. I notice the track listing on both the booklet and CD cover has incorrectly reversed the track numbers for the Ysaÿe and Massenet works. 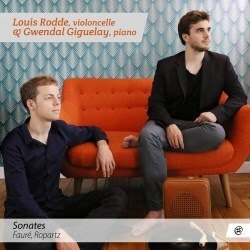 Performed by the partnership of Louis Rodde (cello) and Gwendal Giguelay (piano) the second release, titled Sonates, consists of cello sonatas, two by Fauré and one by Ropartz. All three works were written in a tight period of four years commencing with Fauré’s first sonata, a product of 1917 composed in the midst of the horrors of the First World War. Fauré’s two Cello Sonatas are highly regarded works in the chamber music repertoire and are often placed together on albums. Although both late works, the influence of Fauré’s teacher and adviser Saint-Saëns is never far away. These are engaging works that tellingly display the composer’s unique and engaging voice, cleverly exploiting the cello’s finest and most attractive capabilities. Demonstrating the appropriate qualities of expression and restraint, the partnership of Rodde and Giguelay plays quite beautifully with noticeable clarity and sensitivity. These are stimulating performances and in the D minor score I especially relish the aching and passionate intensity of the ‘Andante’, possibly the composer’s response to the terrors of the Great War that was raging. Striking in the G minor score, is the appealing and generally sunny ‘Finale: Allegro vivo’, in which the impressive writing becomes increasingly impatient and intense in mood. Quite a discovery for me is Ropartz’s romantic Cello Sonata No. 2 a work completed just after the end of the Great War. I cannot recall having heard this work previously and together with his earlier cello sonata from 1904 both look to have only a small number of available recordings. Although a composer with a distinct individual voice it is possible to detect influences of his teacher Franck and the sound worlds of Fauré, Debussy and Ravel are never far away. In a world of volatility and rich lyricism Rodde and Giguelay supply liberal passion to the opening movement (Lent – Ardent) and uncover a searching rather elusive quality in the poignant central slow movement. Marked Très lent - Assez animé, the final movement sees a character of introspection contrasted with outgoing verve in what is a stunning performance of a work which deserves to be far better known. Certainly Rodde and Giguelay, both former students of the Conservatoire de Paris, demonstrate a predilection for these three sonatas, playing with engaging expression in interpretations that are unfailingly stylish. In truth, though, I don’t relish the quality of the recorded sound that is bone dry and boomy in the louder passages. It’s a shame that both instruments lack sufficient tonal warmth which I feel is a real asset in these works. Included in the helpful booklet is an essay by Benoît Menut that contains information on the Fauré and Ropartz works. Released on NoMadMusic these are two engagingly performed albums of chamber music from mainly French composers but the recorded sound is some way from my ideal.